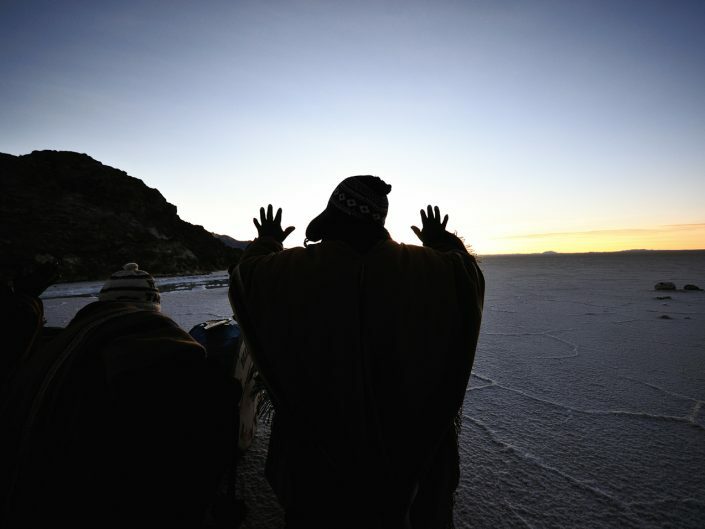 Bolivia, 2010, Tunupa’s Salt Lake, 3.650 metres above sea level. 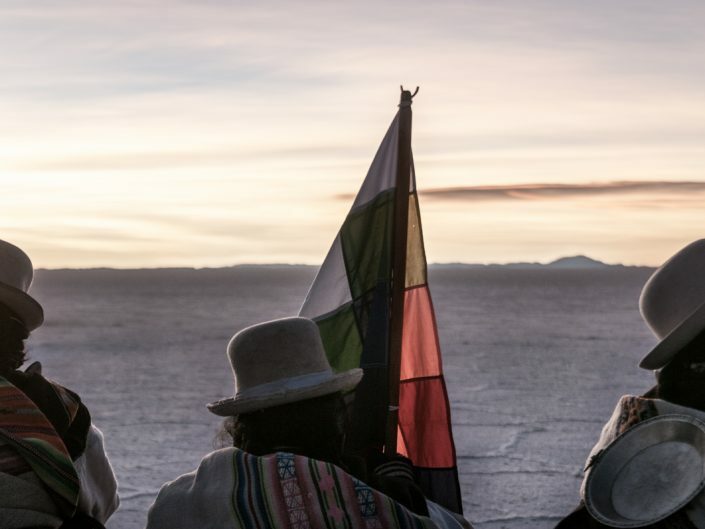 The Aymara, Bolivian indigenous group, celebrate the New Year, in coincidence — not by hazard — with the winter solstice. 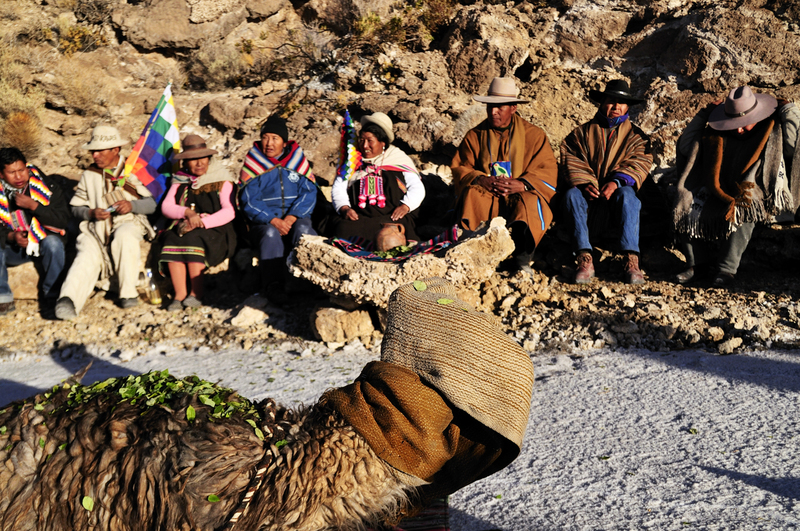 Dances and traditional rituals take place with the very first sunlight, “Pachamama” and “Inti Tata” the central deities worshipped; the sacrifice of a holy “llama” closes the ritual. 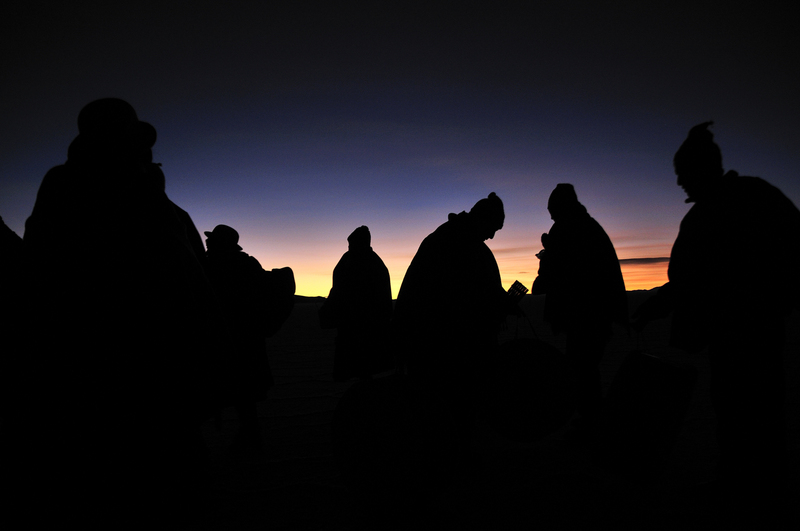 Happy 5.518 to all of you. But are they really that many? 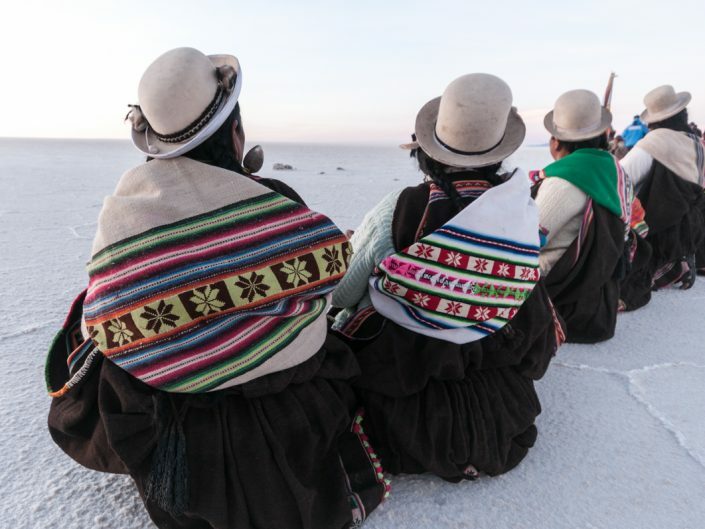 Really impossible to say, given the poor historical sources. And what difference does it make, anyway? 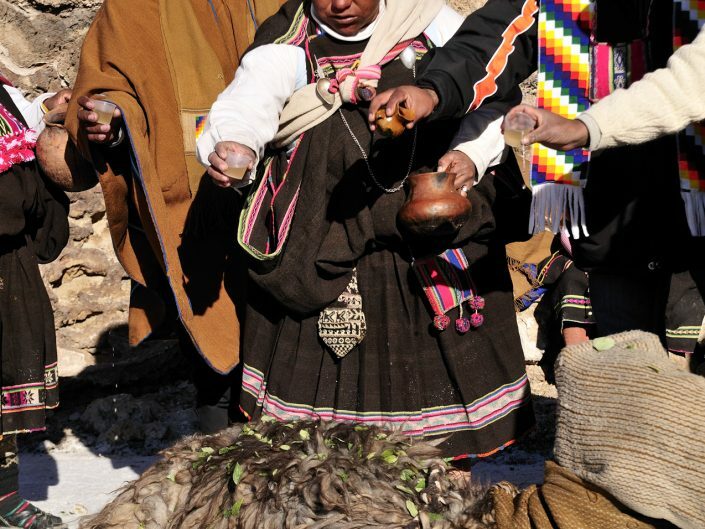 Sure is that ever since 1492 some centuries have gone by. 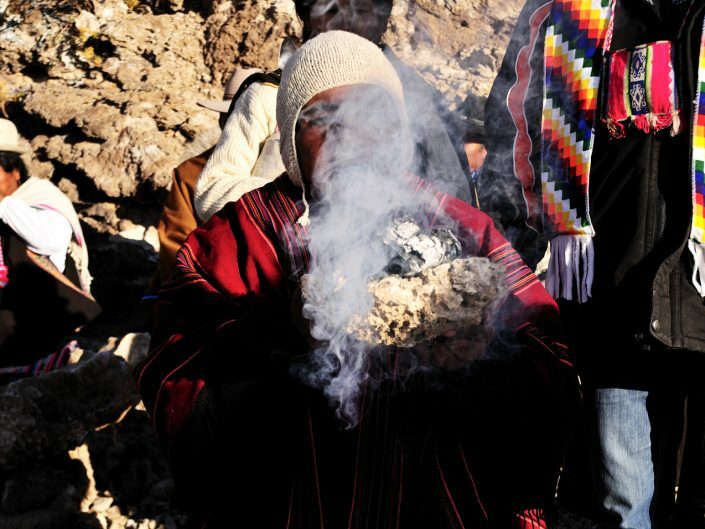 And sure these have not been happy times for the Aymara ethnic group, to whom was forbidden the celebration of traditional ancients rituals. 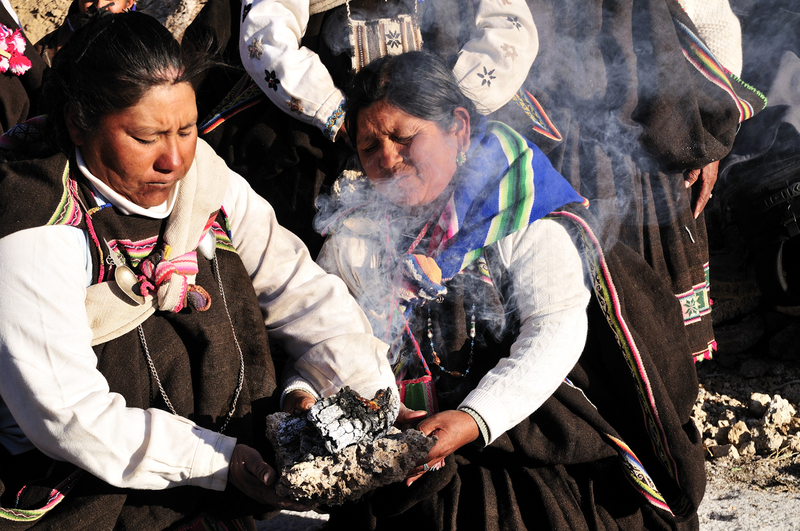 Letting aside the exact computing, the 21th of June 2010 the Aymara’s New Year’s Eve has been celebrated, the beginning of a new year in the Andean world. 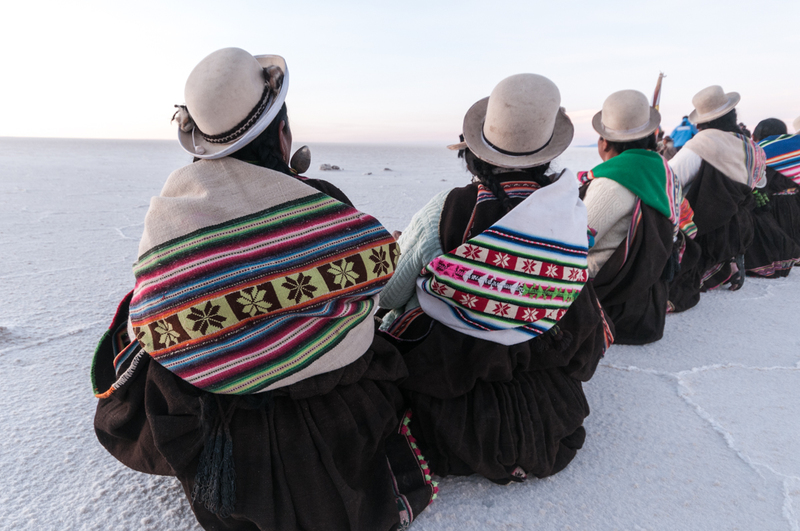 The Aymara are the largest pre-Hispanic ethnic group in Bolivia, in this latter concentrated in the Andean region south from the Titicaca lake. 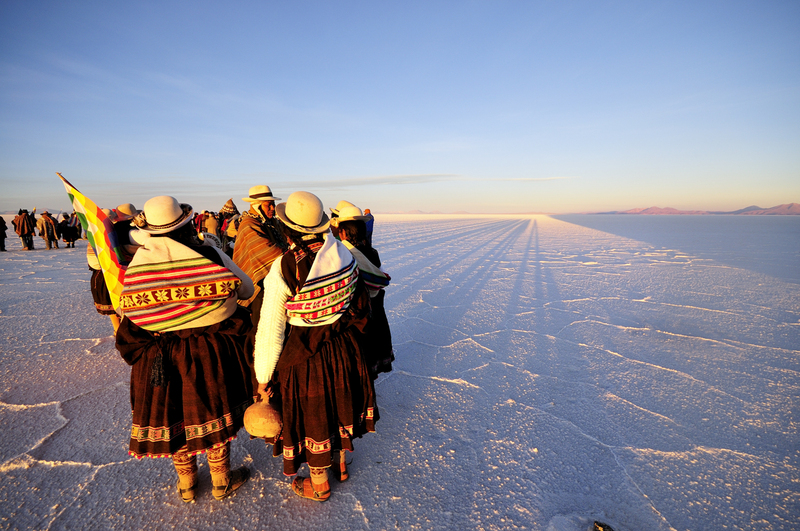 Ancient population, subsequently conquered by the Inca Empire, the Aymara are today devoted to farming and agriculture (they are famous for the cultivations of dozens of different kinds of potatoes, unknown to the conquistadors) and represent a key element of the complex ethnic Bolivian puzzle. 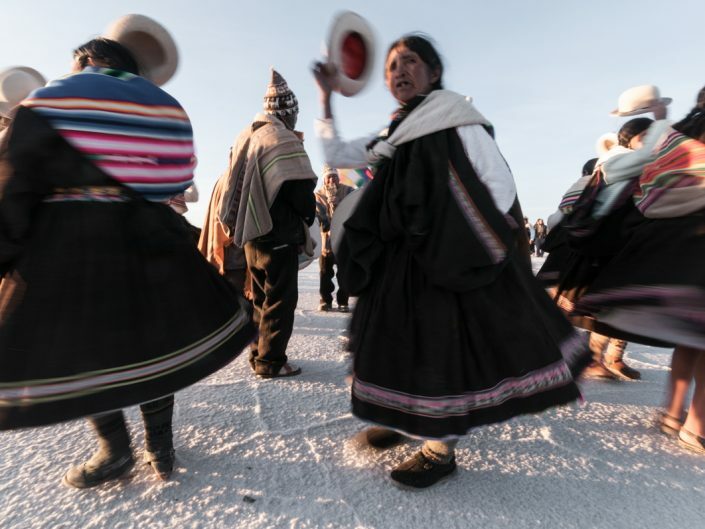 In the framework of the “cultural redeem” pursued by the first indigenous president ever democratically elected (actually of Aymaran blood) the 21th of June is declared national holiday, in the effort of recuperating and valorising ancient traditions and customs, blurred away by modernity and hostile times. 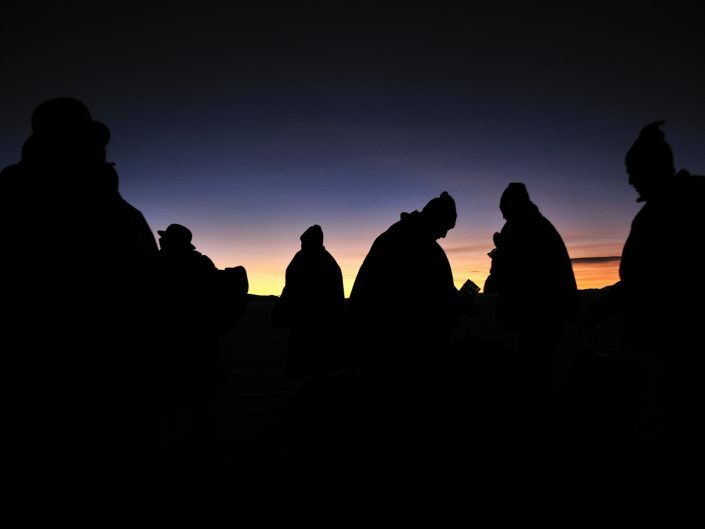 In this hemisphere the 21th of July coincides, not by hazard, with the winter solstice, the coldest and shorter night in the year. 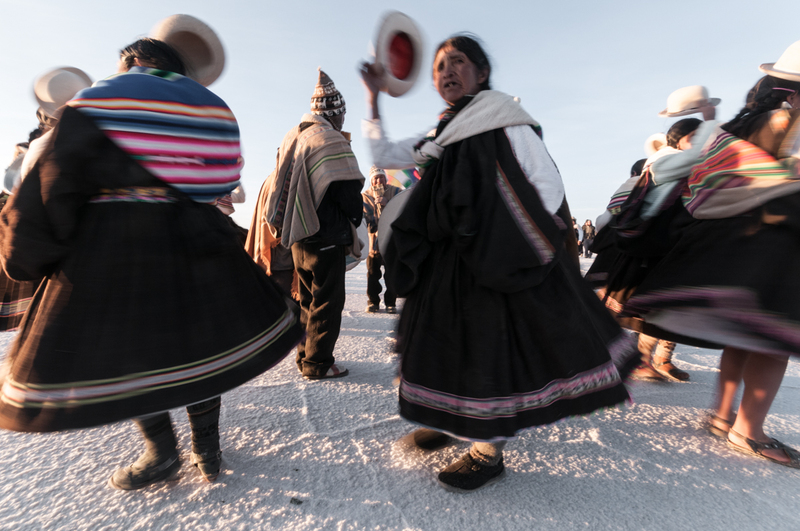 And so the agriculture life’s cycles of the Aymara are interlinked with the meteorological and natural cycles, around which Andean life is still structured. 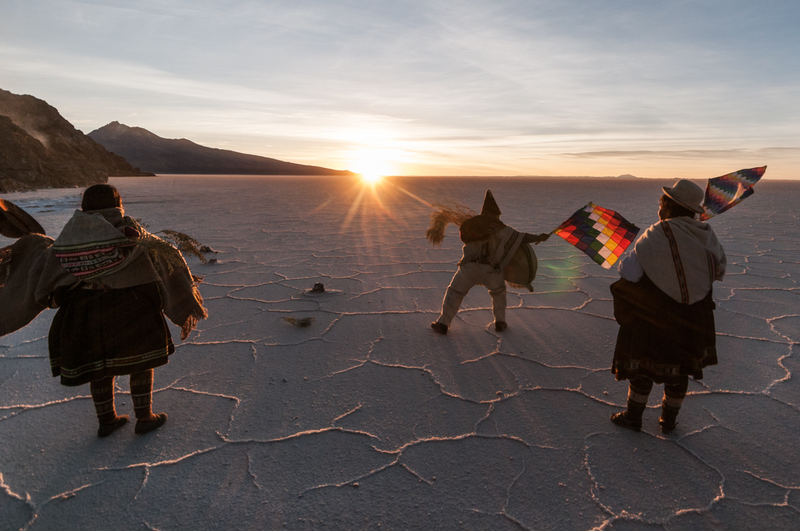 On July 22 the sun shines and warms up again, days become longer, the agricultural season ends and starts once again, new seeds are scattered, is the beginning of a new era in the year. 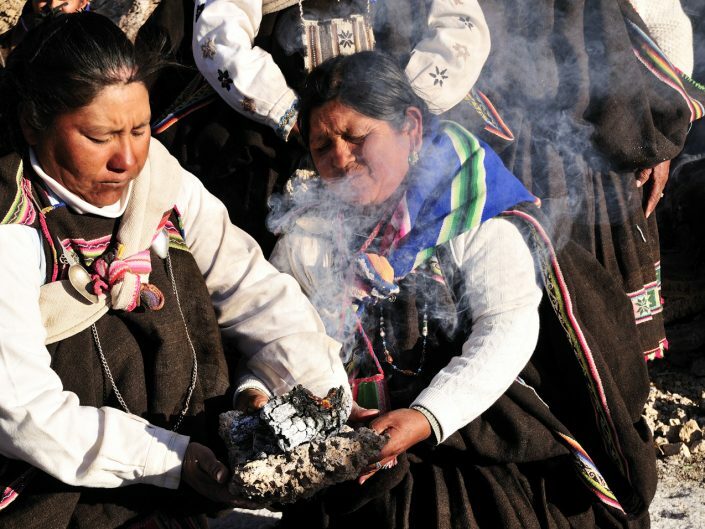 Ever since ancient times the celebration has played an important symbolic role, structured around stars and nature, elements that for the Andean people have always been cornerstones. 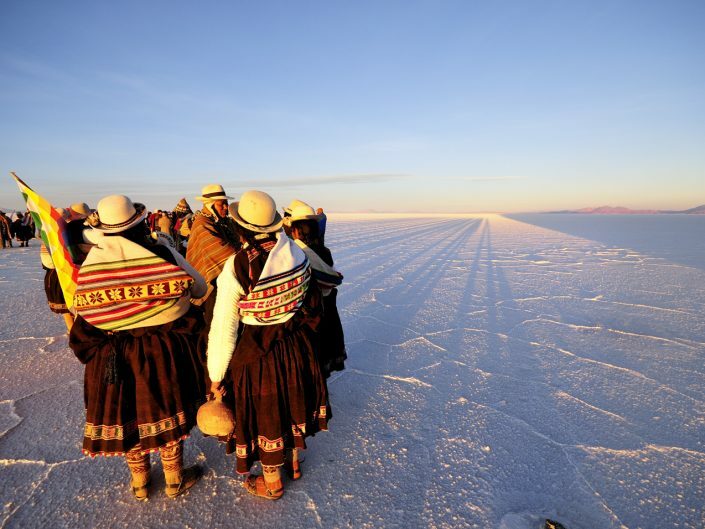 The celebrations for the New Year’s Eve take place in various place in Bolivia, among which the magic and surreal Tunupa Salt Lake, the largest desert salt in the world, located at 3.650 metres above sea level: 10.580 Km squares of pure salt, an endless white desert. Starting at 4:00 a.m., rituals begin, with dances, music, drinking, celebrating the New Year coming. 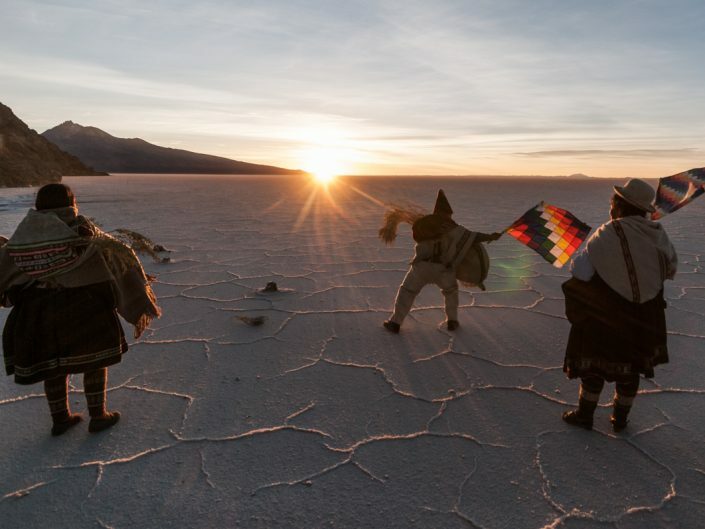 With the first red-orange morning lights a sacred fire is set up, sacred because it is believed that is the continuation on hearth of the “Inti Tata” God; people play and dance on the desert salt. 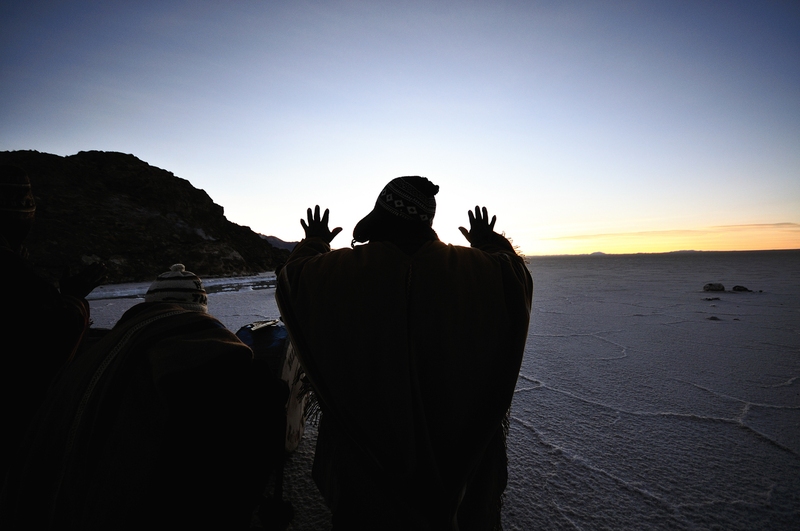 The very first sunrays are welcomed with open hands, the sun is contemplated and admired, thanked and worshipped. Thanks are also given to the Pachamama, through offers like coca-leafs, alcohol, incenses and prays, for her fertility and for her gifts, like the Tunupa Salt Lake. 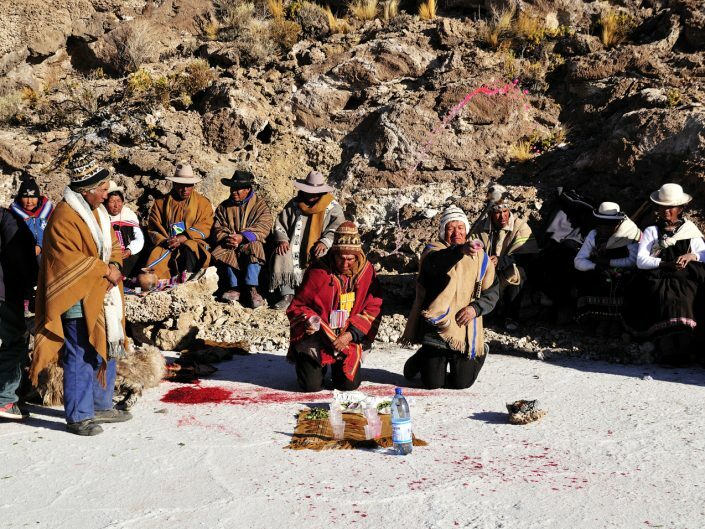 The Aymara participating to the ritual chew coca-leafs and drink, drink which are constantly spilled on the ground as an offer to mother earth. 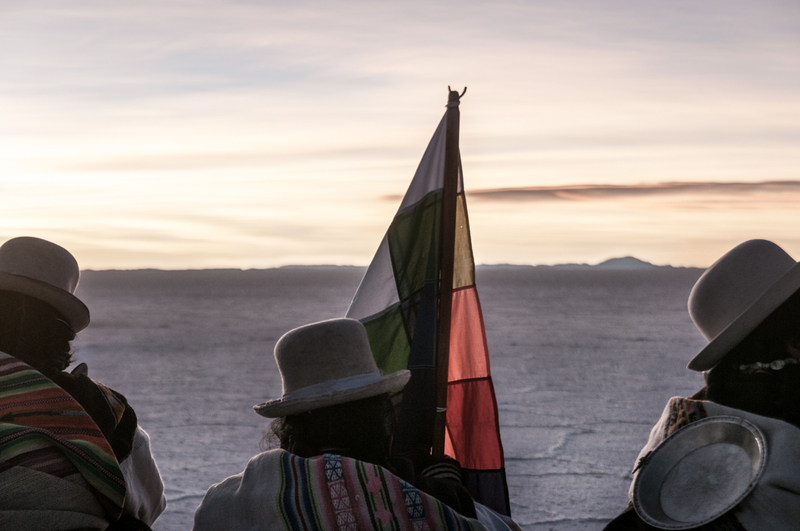 Aymara’s flags are numerous, in a mix of pride and hope for the year to come. 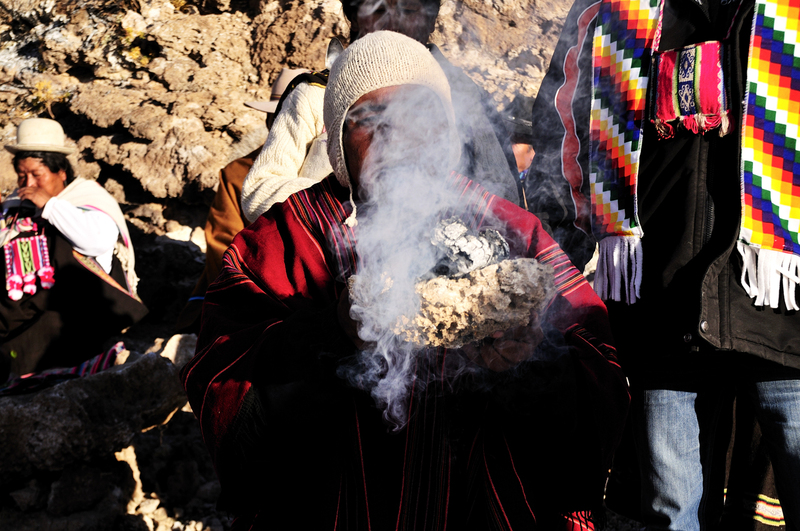 Local spiritual authorities, together with a rapidly raising sun, dispose themselves on the rocks nearby, each one pronouncing words and formulas wishing the best for the next year; incenses, coca leafs and alcohol accompany this moment. 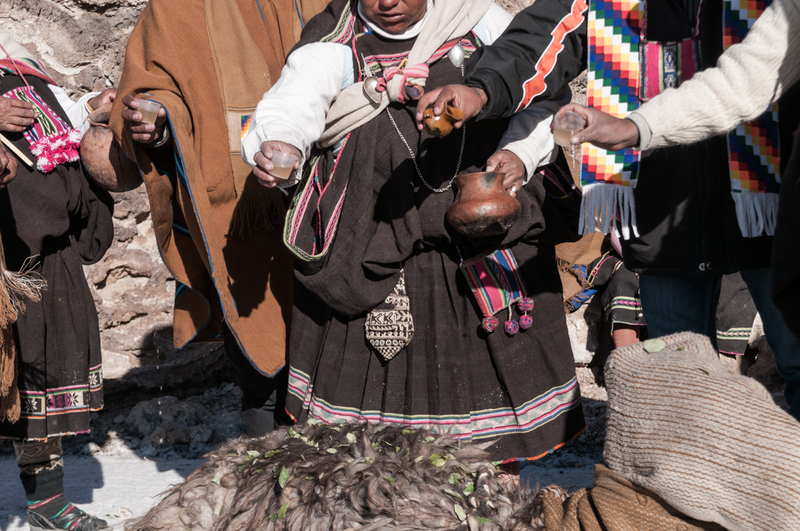 Remarkable is the religious syncretism, which leads to a fascinating mix of elements with clear catholic roots with other more traditional typical of the Aymara culture. 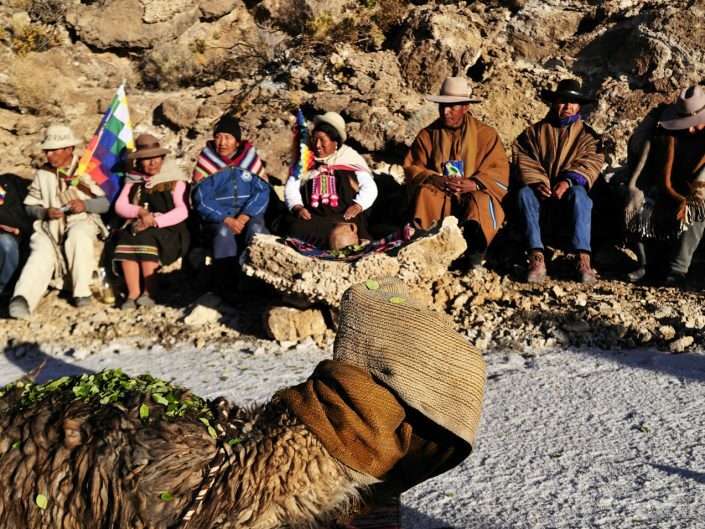 Squeezed between a deep blue sky and the blinding white of the salt, a small car carries until the ceremonial place the most sacred of the Andean animals, a “llama”, ready to be sacrificed. 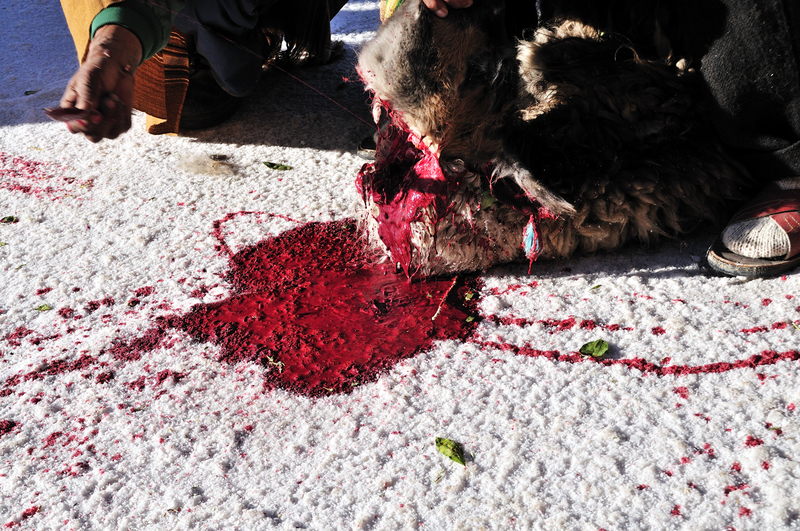 The llama’s head gets completely covered up, until the moment: a firm hand carrying a sharp knife gently cuts the animal’s throat, facing the sun; blood is now spilling everywhere, soon forming a red pool on the white salt. 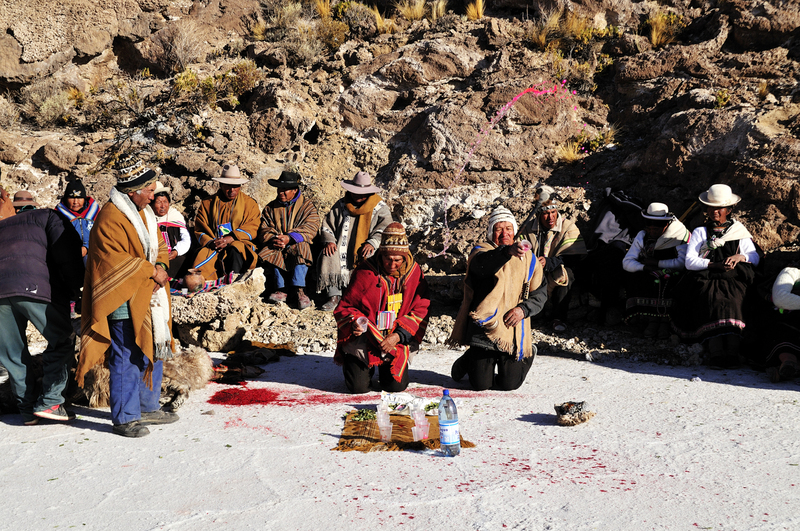 Blood is thrown on participants, as it brings good luck and prosperity. 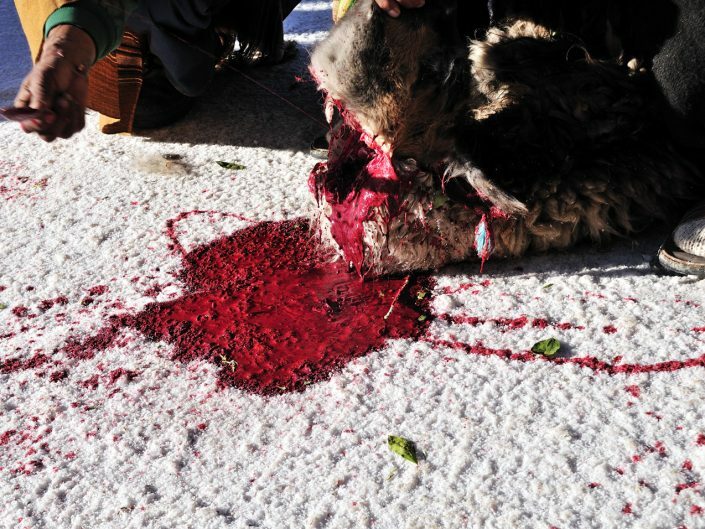 Few minutes later the animal is lying on the ground, dead, and is ready to be opened up in order to remove the precious skin, the fur, and the organs; in particular, it is believed that the llama’s hearth carries drawn the destiny of the new year beginning, for the few ones who can actually read it.